Make unique creations with the Aquabeads Beginners Studio. 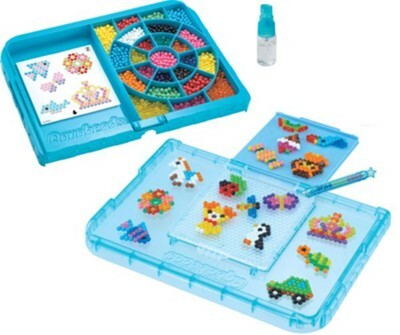 Designed for ages 4 years and older, this set includes over 840 jewel and solid beads in 16 colors, case with bead palette and layout table with new flip tray, bead pen, sprayer, 2 double-sided template sheets and instructions. Just make, spray, flup bead designs off of the tray instantly and they stay! Can be combined for use with the Deluxe Studio (sold separately). Package measures 12.2"W x 2"D x 9.5"H.
I'm the author/artist and I want to review Aquabeads Beginners Studio.